We left Sullivan without incident and arrived in Branson at around 1:30, after a brief stop at Springfield to get information about RV Resorts, and shows in Branson. After a quick lunch in the motor home while sitting in the Walmart parking lot, and picking up tickets for a show, we drove through the downtown strip and then to the recommended RV Park. It was closed for the season. Fortunately, I had located another one in the Good Sam book, our second choice only because it was further out of town. By now it was going on three o’clock and it had been recommended that we arrive at the show by 4:00. 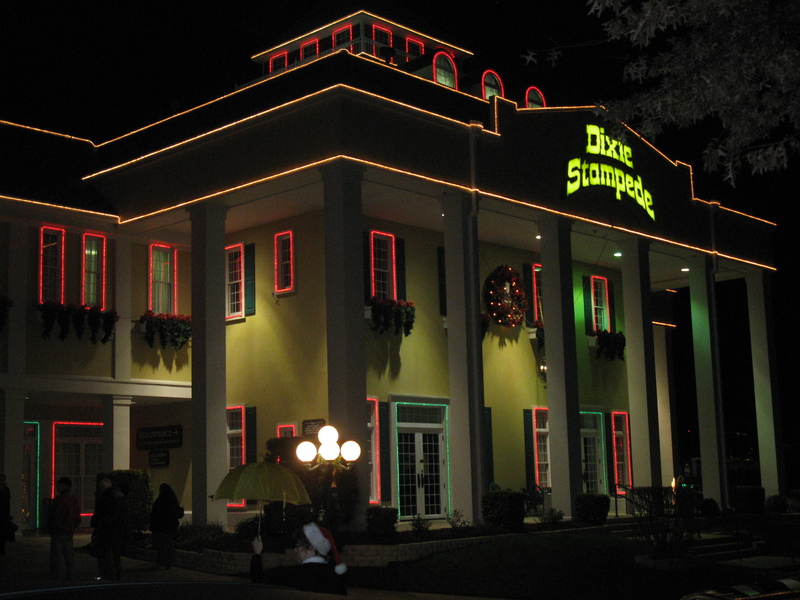 We were going to the Dixie Stampede Dinner Theatre. We found the “America’s Best RV Park” high on a hill. It was large and welcoming, but they were too getting ready to close for the season in a couple of weeks. There were only about a dozen other RVs occupying spots. We registered, found our site and then had to head back into town. The bike was too oily to ride, and they gave us no place to leave the trailer, so we had to take the entire rig along and hope we could find parking. We did. It was a very large parking lot. 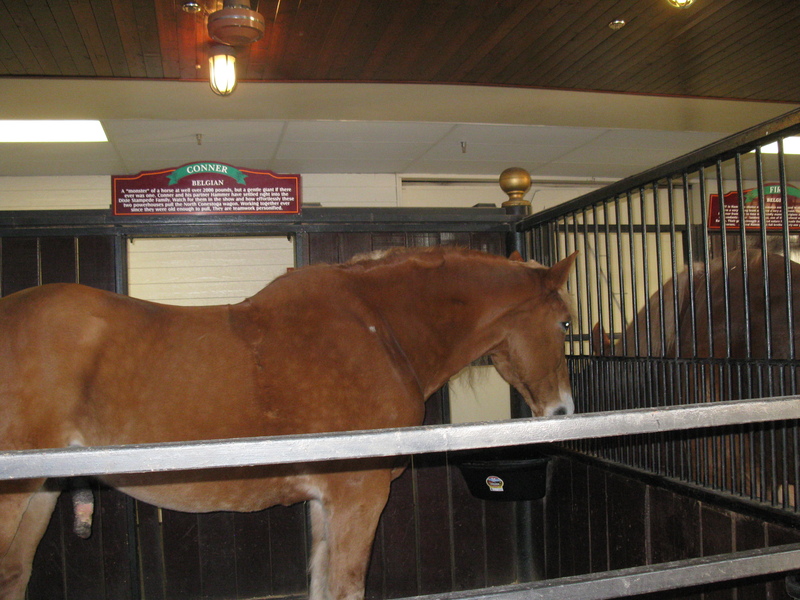 We arrived at 4:00 pm exactly and had time to visit a bit with the horses in the stalls along the walkway to the main entrance. These were the last pictures that we were allowed to take until we exited the building again, two hours later. As with all tourist entertainment shows these days, we had to pose for the staged photo before we were directed into the Carriage Room at 4:30. What a beautiful room with its dark wooden beams, stairs and balconies. In the centre of the room was a stage, and soon the pre-show entertainment arrived, a young man who told us he was going to juggle. Few were impressed; after all, jugglers seem to be a dime a dozen, right? But when this fellow concluded his act, there were many more fans of juggling than there had been. All of his tricks were very unique, skill testing and sometimes downright dangerous, like his finale – juggling flaming torches while standing on the rung of an inflamed ladder that was perched upon a burning rope! Wow! I wanted so badly to sneak my camera out of my purse for a quick photo. From the Carriage Room we were directed to the big horseshoe-shaped arena, another impressive place with tiered rows and rows of shiny wooden “tables” extending around the perimeter, and comfortable chairs where we sat shoulder-to-shoulder with the other guests. The waiters all wore elf costumes, in keeping with the Christmas theme of this show. We were warned that our fingers would be our only utensils. A plate, a bowl with a handle, a sealer jar, and paper napkins made up the extent of our place settings. Soon the show began with the beautiful horses we’d seen outside, now dressed in their finest and ridden by young cowboys and cowgirls in red and green satin shirts and jeans. We watched in awe as they performed some intricate routines, and some of the riders did tricks. We learned from the man sitting next to me that his brother was the Roman-style rider (two horses, one foot on each horse back). During all of this our dinner was being served. Warm cheesy biscuits were placed on our plates, a delicious cream of vegetable soup was ladled into our bowls, and we were offered a choice of iced tea or Pepsi in our sealer jars. 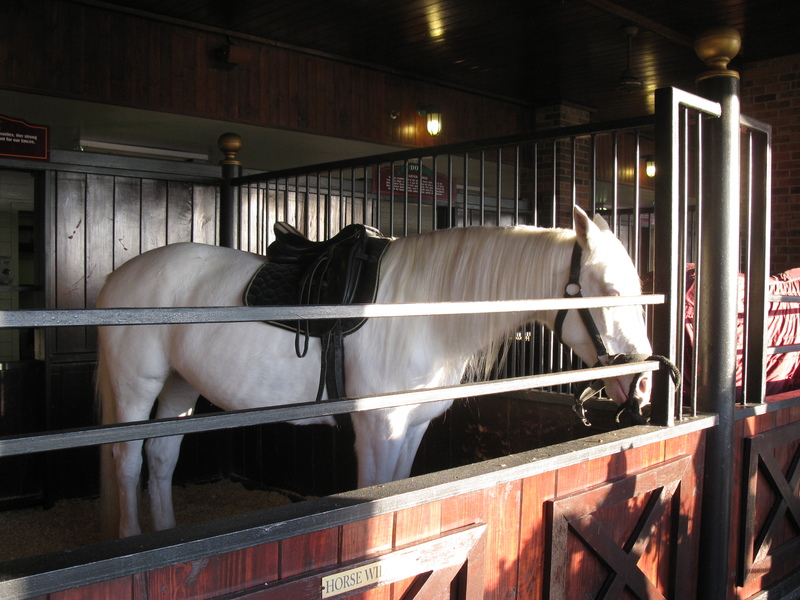 When the horses left and a Toy Shop was lowered from the ceiling, it was difficult to concentrate on eating. A brightly clad toy soldier rode in on a fluorescent lime green and white horse; Raggedy Ann and Andy danced with GI Joe; a fairy princess floated around above them. We thought how much our grandchildren would enjoy all of this. Once the soup and biscuits were consumed, our plates were filled with small whole roasted chickens, thick slabs of seasoned, roasted potato, corn on the cob and a slice of pork tenderloin. The Toy Shop disappeared. We were entertained by a redneck clown, and were divided into teams delegated to cheer for either north or south for various “rodeo” competitions, all done with humour and no harm to any animals. Appropriately, we were on the “north” team, and reigned victorious when all was done. A beautiful live nativity appeared, complete with a donkey, sheep and even the Three Wise Men riding live camels. Carols were sung and Christmas scripture read, before the Angel Gabriel appeared in the sky. We cleaned up our greasy fingers with the warm wet towels provided; our plates were removed and replaced with new ones holding warm apple turnovers! I was glad that I’d opted to use the “doggie bag” for the rest of my chicken! A videotaped Christmas greeting from Dolly Parton, a visit from Santa, and introductions of all the performers brought the production to an end. 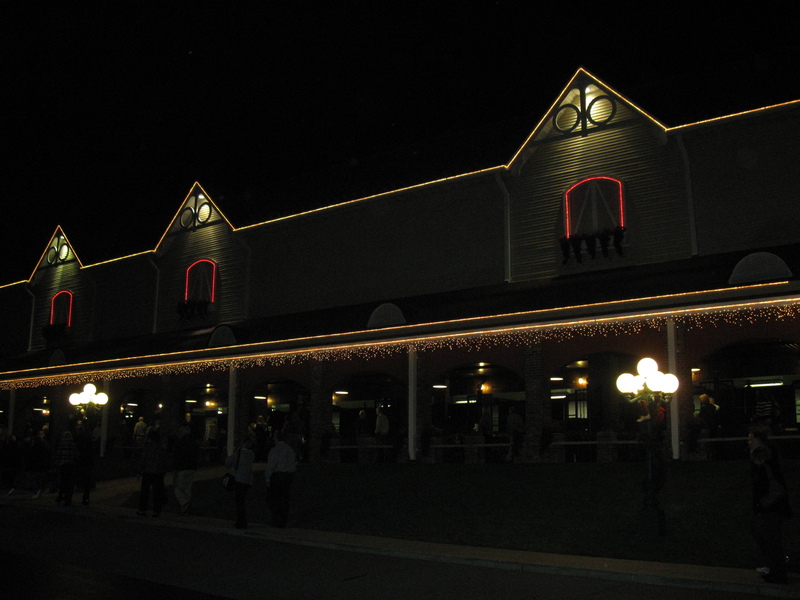 Outside, the darkness was lit up by the pretty Christmas lights. We made our way back to the campsite, full and happy. This entry was posted in Community, Food, Photography, RV Travel, Travel and tagged Branson Missouri, Christmas, dinner theatre, Dixie Stampede, Food, horses, RVing, travel. Bookmark the permalink. We were to 943 yesterday – there was a box – something about a ‘canoe’ – we’ve just seen on TV about that massive storm coming down towards you – for Christ’s sake get safe – we’ll be thinking of you ! ! ! Oo err… me thinks the first horsey was pleased to see you visit! A white dove was released at one end of the arena and it flew around the arena and then flew up and landed on the Angel’s hand. Great food, great show. Yes! I forgot about that amazing detail. Thanks.